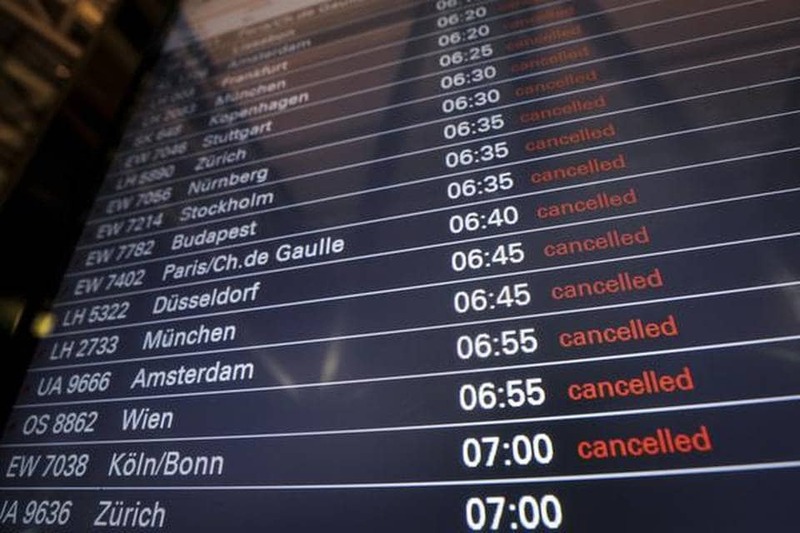 Hundreds of flights were cancelled at eight German airports on January 15, including at the nation’s busiest travel hub Frankfurt, as security staff walked off the job in a deepening row over pay. Germany’s powerful Verdi union said the strike would last from 02:00 a.m. until 8:00 p.m. at Frankfurt airport, with walkouts in Munich, Hanover, Bremen, Hamburg, Leipzig, Dresden and Erfurt following roughly the same schedule. At least 2,20,000 travellers would be hit by cancellations and delays, the ADV airport association said, in a calculation that includes knock-on effects at other airports. Frankfurt airport operator Fraport, which axed 617 out of around 1,200 scheduled flights, urged passengers not to come to Europe’s fourth-busiest airport during the strike. “Security doesn’t come free,” read a banner held aloft by Verdi members demonstrating at the airport, clad in yellow high-visibility jackets. German passenger Brigitte Inhof told AFP that she was going to have to travel by bus to a different airport to catch a flight to the Turkish resort of Antalya. “I should have flown direct from Frankfurt to Antalya, now I have to make my way to Stuttgart,” she said. Germany’s flagship carrier Lufthansa accused Verdi of ramping up tensions “to an unacceptable extent” while the ADV association blasted the wave of strikes as “irresponsible”. “Verdi is unjustifiably carrying out these strikes on the backs of travellers, airlines and airports,” ADV head Ralph Beisel said in a statement. Verdi, which represents some 23,000 aviation security workers, said it was forced to step up pressure because talks with the BDLS employers’ association were deadlocked. “Employers did not respond to last week’s warning strikes at all, they haven’t come up with an improved offer,” Verdi board member Ute Kittel told public broadcaster ZDF. Rates currently vary nationwide, with staff in some airports in eastern Germany earning around 14 euros hourly, compared with just over 17 euros for their peers in the capital and western parts of the country. “Security is not worth less in the east, and the employees are not worth less,” said Kittel.